We work in collaboration with Haiti’s Ministry of Public Health and Population and other organizations to deliver culturally appropriate, high impact health interventions. Our approach reduces the three major delays- the delay in the decision to seek care, the delay in reaching care, and the delay in receiving adequate care- that prevent women from accessing life saving maternal care. We train skilled birth attendants from rural areas and get them to women who need them. Our programs educate and empower Haitian women and men to improve the health of their communities, creating lasting change in their lives and the lives of the mothers and children they care for. Midwives For Haiti offers a rigorous 14-month training program for Haitian nurses to become Skilled Birth Attendants. Six Haitian teachers are supported by visiting volunteer international midwives and other medical professionals who supplement the students’ learning and skills. Students complete both classroom and clinical hours. Upon completion of the program, graduates receive a Certificate in Essential Obstetrics from the Ministry of Public Health and Population and go on to work in hospitals, birth centers, and community projects throughout Haiti. Since 2006, we’ve trained 154 Skilled Birth Attendants. As there are currently 400 obstetricians and 201 nurse-midwives in Haiti, our graduates make up about 17% of the total skilled providers working in Haiti. When we began working in Hinche in 2006, only one obstetrician and one nurse staffed the local St. Therese Hospital. And, they only worked day shifts. If you were a laboring mother when the hospital was closed, care was not available until 8am the following day and not at all on the weekends. The cleaning lady often caught babies during the night. Since many of the women coming to the hospital at this time were only doing so because they required emergency care, many mothers died. Over time, as we trained and graduated more students, word spread throughout the community that the hospital was now a safe place to give birth. In collaboration with the Ministry of Health, who runs the hospital, we began employing several of our graduates to staff the maternity ward 24/7. We now pay the salaries of 16 Skilled Birth Attendants working there, utilize the hospital as the site of our clinical training, and support the maternity center with further resources and supplies. Mothers no longer have to worry that they will be turned away, that there will be no one to care for them, or that they won’t have access to life-saving medication. Within four years of working at the hospital, the percentage of women in the catchment area coming here increased from 2% to 28%. Each year, over 2,200 births are attended by our students and Skilled Birth Attendants at St. Therese Hospital. 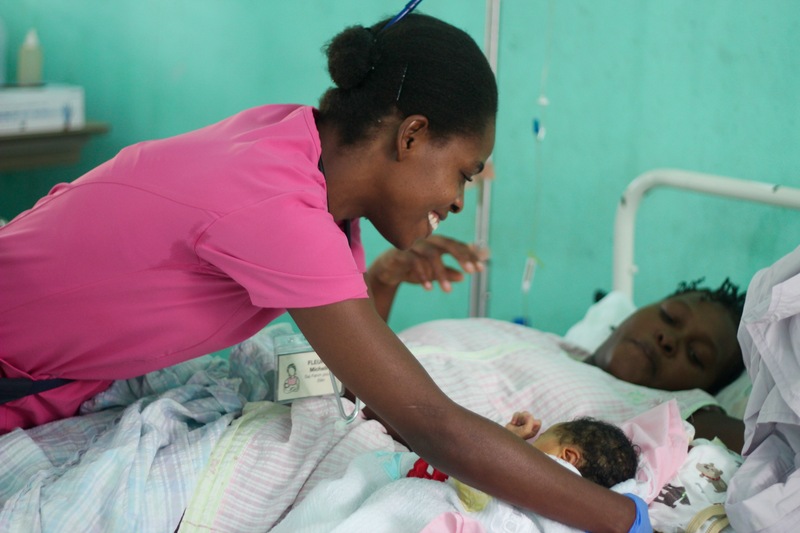 In collaboration with Haiti’s Ministry of Health and Population, our Postnatal Care Program ensures that mothers and newborns at Hospital St. Therese are thoroughly evaluated before discharge, given excellent education and scheduled for follow-up visits in our new postnatal clinic. Within a year of launching this program in 2014, we increased the number of patients receiving postnatal care at Hospital St. Therese from 1% to 93%. The Postnatal Care Program is filling a critical gap in the continuum of maternity care at St. Therese as postnatal care can mean the difference between life and death for moms and babies. Since 2010, our Mobile Prenatal Clinic employed four full-time and two part-time Haitian Skilled Birth Attendants to work in 22 rural villages throughout the Central Plateau. We have now formed a partnership with the Ministry of Health to provide a weekly prenatal clinic in their already existing clinics. We employ the midwives who travel to eight community clinics built by the Ministry of Health. These clinics already provide immunizations, nutrition services, family planning, and limited primary care. Now they can offer weekly prenatal and postpartum care.Our midwives will typically see between 500-700 mothers each month, providing prenatal or postpartum care, education, vitamins and iron supplements, and treatment for intestinal worms. Women with gestational or chronic hypertension, a common problem in Haiti, receive anti-hypertensive medication. Each patient is tested for HIV, syphilis, and malaria (when symptomatic). Patients with HIV or syphilis are referred to the hospital for further testing and treatment. Patients with gonorrhea, chlamydia or malaria are treated by our midwives. Without the Community Prenatal Clinic, these infections would not be treated and risk the health and lives of mothers and babies. Matwòns are Haiti’s traditional birth attendants. These wise men and women attend an estimated 75% of deliveries in Haiti, most of which are outside of medical facilities. (UNICEF 2013) For mothers living in rural areas without access to medical facilities, matwòns are crucial. Although these men and women learn valuable skills from family members and friends, many have not been formally trained to recognize danger signs during pregnancy or to utilize life saving maneuvers for labor and delivery. Our Matwòn Outreach Program offers a 5-month formal training program in achieving clean, safe deliveries by utilizing strategies that have been statistically proven to reduce rates of maternal and neonatal death. Along with providing matròns with Clean Delivery Kits, we are working to better integrate them into the medical system. Many matròns who have graduated from our program now accompany high risk mothers to prenatal care clinics or to medical facilities for delivery. Watch this short video to see the program in action. Since beginning this collaboration in 2012, we’ve trained 122 matwòns in five remote communities, provided over 1400 Clean Delivery Kits, and have seen an exponential increase in referrals of high risk mothers. In rural Haiti, only 25% of mothers have access to a skilled birth attendant during childbirth. For the poorest women, this number falls to 9.6. (UNICEF 2013) Filling the critical gap in care is essential to our mission. Our birth center is strategically located in a remote region of the Central Plateau (three hours from our headquarters in Hinche), where the maternal mortality ratio (MMR) is roughly three times the country’s average and about 18% of children here don’t live past the age of five. The Carrie Wortham Birth Center- named after our recently lost friend and advocate- closes a critical gap in care for the mothers and families of Cabestor by providing 24/7 access to skilled attendants and a safe, clean space for prenatal, delivery, and postnatal care. In addition, other health and wellness services are offered, including breastfeeding support, health education, general medical care, and matròn training. The Carrie Wortham Birth Center, with the support of Every Mother Counts, officially opened its doors in November 2015 serves as a safe haven for hundreds of women and their families each year to grow healthier and stronger.